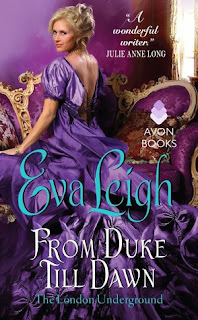 Over the past few years, I've become a big fan of Eva Leigh's. Her books are always engaging and heartfelt. I never have to worry about not liking one of her stories, and the same is said for this title. I'm a little behind on reading this book but figured better late than never! The blurb for From Duke Till Dawn was an interesting one that immediately had me hooked. I am usually drawn to the bad boy type of man, but Cassandra and her plights throughout the book gave me a little girl crush. The way she grew up on the streets and what she had to do to make it one day at a time softened my heart towards her. Yes, she did some things that she shouldn't have had to do, but if she had another choice she wouldn't do them. And when a situation was unceremoniously dropped into her lap, she took immediate responsibility to right a wrong that affected a lot of people. She showed real mettle and I loved her character. I don't say this often, but I wasn't head over heels in love with Greyland. Don't get me wrong. I truly enjoyed his character. I loved reading through his change in feelings when it came to Cassandra. I can't put my finger on it though, but something was just slightly off. It didn't deter me from reading through the book in less than twenty-four hours, though. I just downloaded the next in the series, Counting on a Countess, and can't wait to dive in here in a few minutes. Eva Leigh never disappoints! Just wanted to tell you that I've been stopping by and wondering if you moved to another blog address or something.